Weekend Horse Racing News Saturday, September 27, 2014; Super Horses, Super Races, All Part of Super Saturday: Super Saturday was quite super. 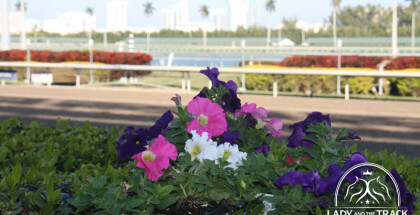 With more than twelve graded stakes on the cards across the country! Super Saturday produced longshot winners and obvious winners. We saw an early Kentucky Derby favorite and an impressive maiden winner on the turf. While Tonalist was running a winning race in the Jockey Club Gold Cup, Moreno took out Wicked Strong, causing him to clip heels and throw jockey Rajiv Maragh. Rajiv suffered a broken arm and Moreno was disqualified to last for causing the accident. $90K Maiden Special Weight: Starting off with Race 3 at Belmont, on the turf is usually not the way to start a card full of stakes races, but the 8.5F maiden special weight had a lot of good looking juveniles in the field. A field of 9 went to post, and when it was all said and done, Gustnado, a Bill Mott trainee, took home the win money. A colt out of an Unbridled mare, by Smart Strike, this colts pedigree screams distance, no matter the surface, but he definitely looked like a future turf star with his maiden win today! Grade 2 Kelso: The heavy favorite in the race was Woodward winner, Itsmyluckyday. Supposedly using this race as a foundation race for the Classic, Itsmyluckyday faded to third after engaging in a speed duel with Bradester and River Rocks. Vyjack sat the perfect trip and got up to his winning ways again. Grade 1 Beldame: Stopchargingmaria was scratched from last week’s Cotillion (Untapable wins over Sweet Reason) to run here. Seemingly the horse to beat, rival Belle Gallantey took ahold of the lead, and never looked back. She opened daylight throughout the race and just kept going. Stopechargingmaria kept up for second. Belle Gallantey should be headed to the Breeders’ Cup Distaff after the impressive. Grade 1 Flower Bowl: Stephanie’s Kitten was made the race favorite, although she had failed to get a win since the 2013 Just a Game. She was kept closer to the pace today, and it worked! She took the Flower Bowl impressively. With this win, Stephanie’s Kitten not only extended her graded stakes record to 6 wins, but also became the only Kitten’s Joy offspring to earn over $2 million dollars. She is headed to the F&M Turf on Breeders’ Cup day, and then to the Fasig-Tipton November Sales. Grade 1 Vosburgh: Private Zone was not the horse to beat in this race, but he was the defending champion. He was up against history today. The last horse to win back-to-back Vosburgh’s was in 1989-1990, Sewickley. Private Zone took the race to Dads Caps early and never looked back. He won the race by a desperate neck, making history and a spot in the Breeders’ Cup Sprint. Grade 1 Joe Hirsch Turf Classic: Main Sequence was one of the favorites for this race, and he did not disappoint his connections or supporters. He completed the race, while surviving an inquiry against Twilight Eclipse in the shadow of the wire. 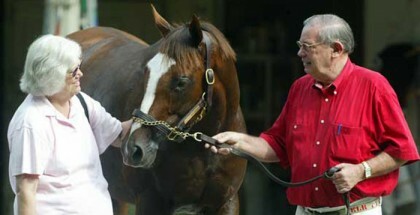 The Joe Hirsch was Main Sequence’s third grade one race in America, and his third grade one win in America. Main Sequence is likely headed to the Breeders’ Cup Turf, hoping for a fourth grade one win in as many starts (in America, that is). Grade 1 Jockey Club Gold Cup: The Jockey Club Gold Cup was seemingly the race of the three-year-olds. V.E. Day, Wicked Strong, and Tonalist finished 1-2-3 in the Travers, but not here. Tonalist reined supreme on his favorite track. While Tonalist was running a winning race, Moreno took out Wicked Strong, causing him to clip heels and throw jockey Rajiv Maragh. Rajiv suffered a broken arm and Moreno was disqualified to last for causing the accident. 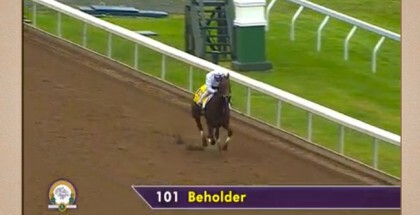 Grade 1 Zenyatta: The Zenyatta was the expected comeback of Beholder, and what an easy comeback race for her. The field was small, but had some quality there. She did put away Iotapa, who she will see again in the BC Distaff. She is headed to defend her title in the Distaff in about 5 weeks. Grade 1 Frontrunner: The Frontrunner is a very good prep for the Breeders’ Cup Juvenile, and we may have very likely seen the 2014 Breeders’ Cup Juvenile winner in the field. American Pharoah went to the front and never looked back. The Pioneerof the Nile ridgling liked the lead, and is now a duel grade one winner. Broke his maiden last out in the G1 Del Mar Futurity, he proved two things today; that he can run on dirt and he can run around two turns. He is a likely favorite for the Juvenile and likely an early Derby favorite. Grade 1 Rodeo Drive: Emollient was back, this time on the turf, and with blinkers. Rosie and her seem to get along nicely, but no one knew which version of Emollient would show up. The gutsy Emollient definitely showed up today. She won, surviving the drama that Moulin De Mougin created at the turn, slipping and falling. The field was unaffected by the fall, and there was also a dead heat for third. Irish Mission and Ruby Slipper both paid out show money. Grade 1 Awesome Again: Shared Belief went to the post as the 1-5 favorite. Shared Belief was the closest thing to a sure thing that horse racing would likely get in this race. Breaking perfectly, Sky Kingdom and rider Victor Espinoza floated Shared Belief 5 or 6 wide through both turns. While killing Sky Kingdom’s chances, Shared Belief caught leader Fed Biz in the shadow of the wire, keeping his record perfect at 7 wins in as many starts. He is headed to the Breeders’ Cup Classic. Unzip Me Stakes: The turf sprint here was down the hill. At the start, the European Stars Above Me took off, and was hoping not to look back. She almost went all the way, before being caught late by Angela Tangier and Gender Agenda. Angela Tangier held off Gender Agenda for the win. Grade 1 Chandelier: The Chandelier is one of the best preps for the Breeders’ Cup Juvenile Fillies, and Angela Renee could easily continue that statistic. She was an easy winner of the 2014 Chandelier, and will remain in California, training for the Breeders’ Cup. She is also the full sister to Grade 1 winner To Honor and Serve. She may even be the favorite come the BC Juvenile Fillies.